Each basket is stocked with a variety of quality imported beers, including familiar names like Corona and Heineken. When you treat someone special to this party starter, they will likely find some of their favorite labels along with new flavors that can easily become their new favorites. 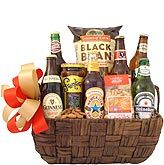 While this is the perfect gift to get a celebration started, it's also the beer basket that you order when you want to impress someone. Whether it's time to celebrate your best friend's engagement or you want to send good vibes to your colleagues, you can't go wrong with a mix of gourmet snacks and imported brew. It's too good to enjoy alone, so get ready to pass the goodness around. This was the third order that I have placed with Beer Gifts and I have never been disappointed. The recipients of these gifts absolutely love them. Ordering is extremely easy, and the gifts always arrive when promised. I will definitely order from them again. I ordered presents from BEER GIFTS for four of my sons as birthday gifts, and they were GREAT!! The boxes arrived promptly and in perfect condition, and the contents were delicious and really appreciated. I will order again from this company. 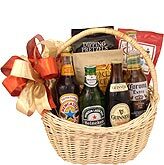 I've ordered several beer baskets now from BeerGifts.com and have received exceptional service each time. The recipient loves the gift and it couldn't be more perfect. I bought this for my husband for Valentines Day, he absolutely loved it. Quick shipping, great packaging. Will order again soon. This was my second experience sending baskets. Delivery and product was great, I recommend Beergifts, you wonâ€™t be disappointed. Everyone loved the basket for its beauty and contents. Great idea for a raffle. This was a Birthday gift for my son. He told me he liked the gifr basket. Great basket and delivered on time, even during the holiday season! Lovely gift for a raffle. Everyone was impressed.